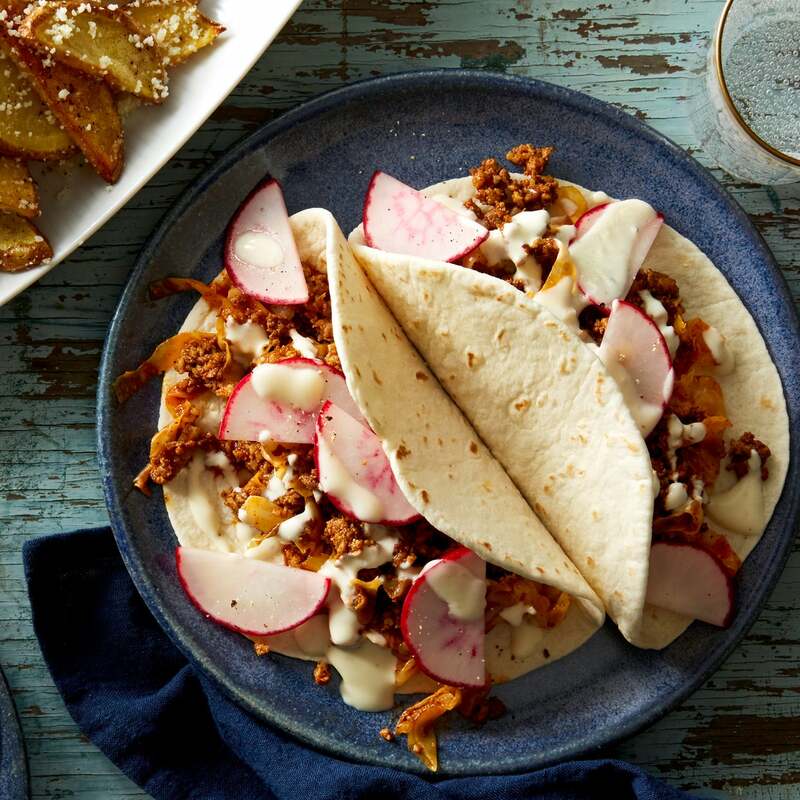 These tacos get plenty of bold flavor from ground chorizo (a type of spiced pork sausage), cooked into a delightfully saucy filling with cabbage and fresh citrus juices. On the side, we’re livening up roasted potatoes with garlic and Cotija cheese. Preheat the oven to 450°F. Wash and dry the fresh produce. 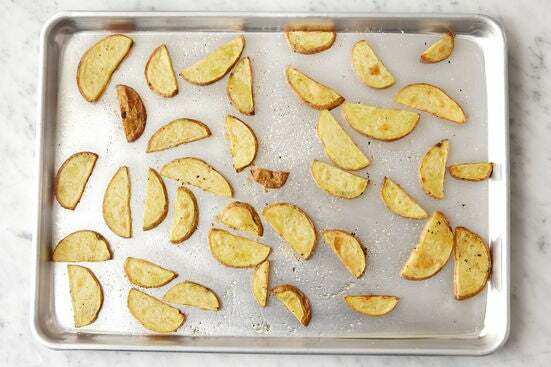 Halve the potatoes lengthwise, then cut crosswise into 1/4-inch pieces. Place on a sheet pan. Drizzle with olive oil and season with salt and pepper; toss to coat. Arrange in an even layer. Roast 22 to 24 minutes, or until browned and tender when pierced with a fork. Carefully transfer to a large bowl. While the potatoes roast, cut out and discard the core of the cabbage; thinly slice the leaves. Halve the orange; squeeze the juice into a bowl, straining out any seeds. Cut off and discard the ends of the radishes; halve lengthwise, then thinly slice crosswise. Peel and finely chop the garlic; using the flat side of your knife, smash until it resembles a paste (or use a zester). Quarter the lime. 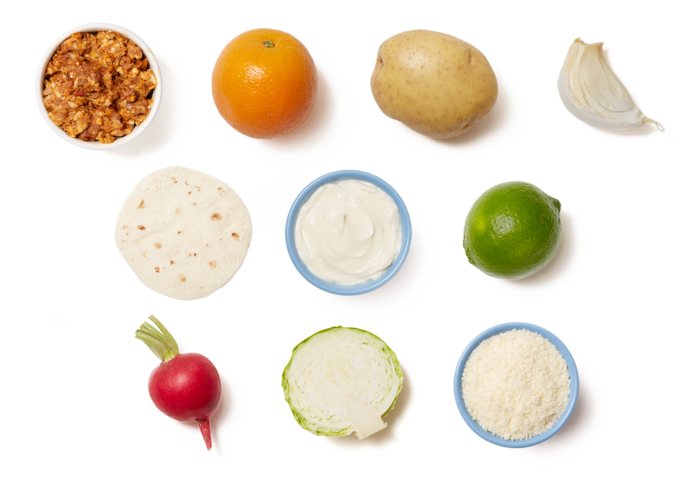 In a bowl, combine the crème fraîche and the juice of 1 lime wedge. Drizzle with olive oil and season with salt and pepper to taste. 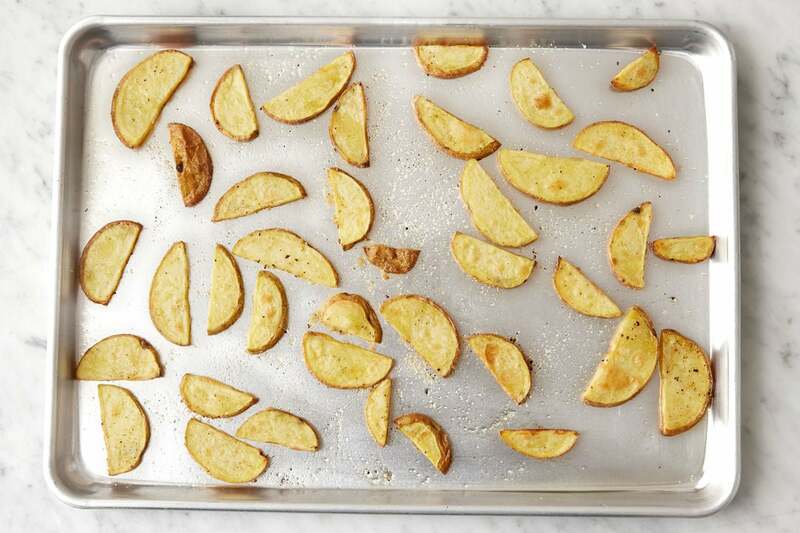 While the potatoes continue to roast, in a medium pan, heat 2 teaspoons of olive oil on medium-high until hot. Add the ground chorizo; season with salt and pepper. 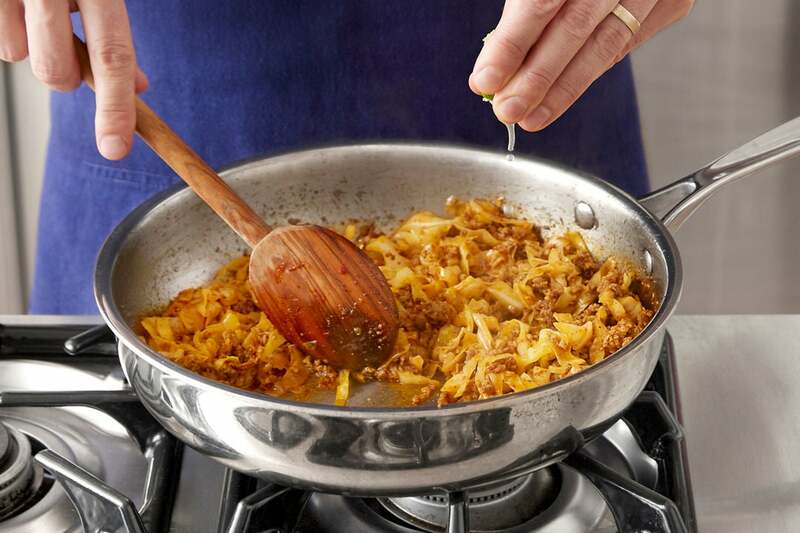 Cook, frequently breaking the meat apart with a spoon, 3 to 5 minutes, or until browned. Add the sliced cabbage; season with salt and pepper. Cook, stirring occasionally, 2 to 3 minutes, or until slightly softened. Add the orange juice and 1/2 cup of water; season with salt and pepper. Cook, stirring occasionally, 6 to 7 minutes, or until the cabbage has softened and the chorizo is cooked through. 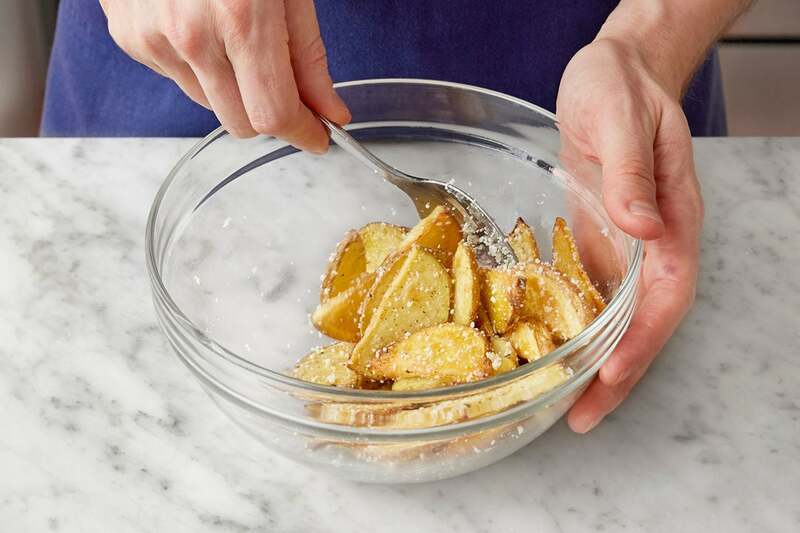 Turn off the heat and stir in the juice of 2 lime wedges; season with salt and pepper to taste. While the filling cooks, place the tortillas on a large piece of aluminum foil and tightly wrap to seal. Place directly onto the oven rack and warm 5 to 7 minutes, or until heated through and pliable. Transfer to a work surface and carefully unwrap. 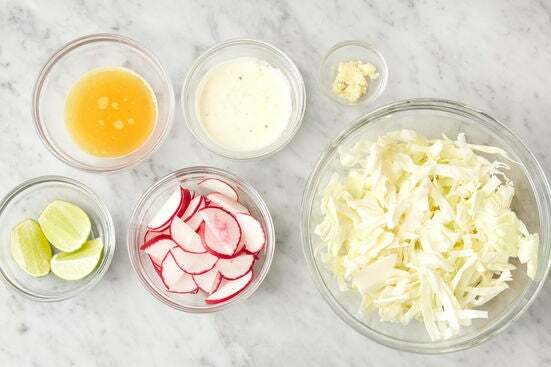 While the tortillas warm, in a bowl, combine the sliced radishes and the juice of the remaining lime wedge. Drizzle with olive oil and season with salt and pepper. While the tortillas continue to warm, add the cheese and as much of the garlic paste as you’d like to the bowl of roasted potatoes. Stir to coat; season with salt and pepper to taste. 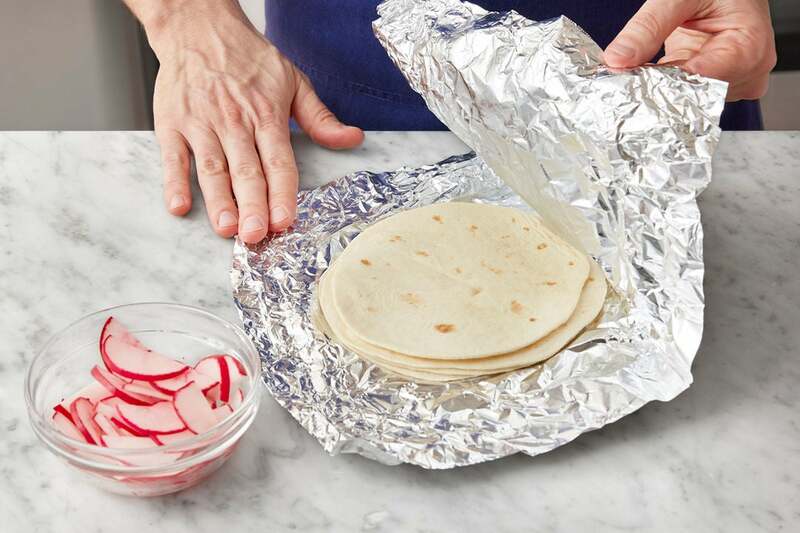 Divide the filling, seasoned radishes, and lime crème fraîche among the warmed tortillas. 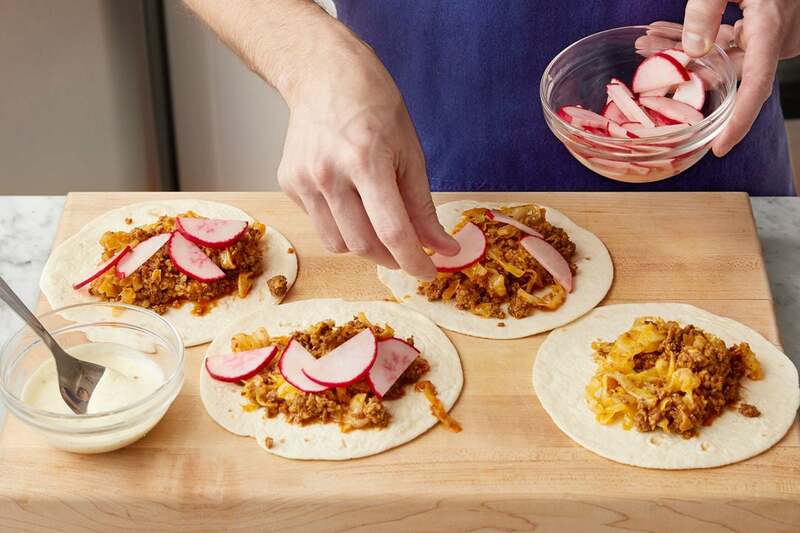 Serve the tacos with the finished potatoes on the side. Enjoy!